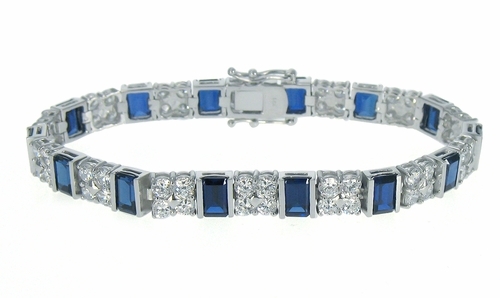 This is one gorgeous bracelet, especially if you love colored stones. Our Pandora .75 Carat Each Emerald Cut and Round Cubic Zirconia Bracelet features channel set .75 carat 6x4mm each emerald cut stones alternating with a quad link of rivet set of 3mm each round cubic zirconia stones. The emerald cut stone is available in your choice of canary yellow cubic zirconia or man made sapphire blue gemstone. The total carat weight includes approximately 14 carats of the finest hand cut and hand polished original Russian formula cubic zirconia. The clasp also features a double figure eight safety clasp for added security. 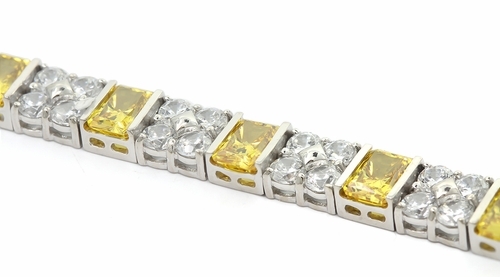 This bracelet is available in 14k white gold or 14k yellow gold and in your choice of a 7 inch length or upgrade to an 8 inch length, please call us for details. For further assistance, please contact us directly at 1-866-942-6663 or visit us via live chat and speak with a knowledgeable representative.